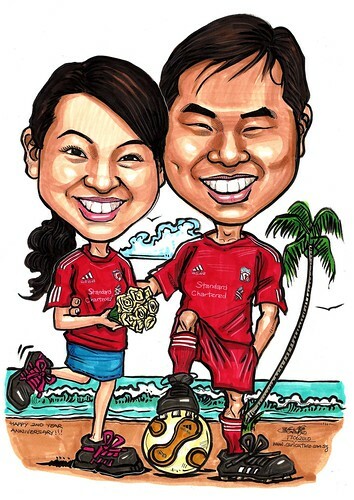 I was recommended by Catherine who got you to do for her a color caricature as a poster for their wedding. From your blog, I believe you term their poster as a "Fairy tale wedding @ Goodwood Park. I am really impressed with what you have done for her. Hence, I would like to get you to help me to do a color caricature poster (A3) as well. I intend to give it as a gift to my hubby as a 2nd year anniversary present. Hubby: Standing on the left(he will be standing on the right when we are looking at the picture) with one of his feet on a soccer ball, left hand in his pockets and his right hand around my waist. Myself: Standing on the right with a bouquet of flower in both of my hands and my head resting on my hubby's shoulder. My feet should probably be placed like an angled 'T' or whichever position you deem best. Can I also have a message on the top right corner of the poster that goes “Happy 2nd Year Anniversary”? As such with this message, I am not sure if the position of us will be more to the left of the poster? In any case, I believe you will know what will be the best." As the head is bigger than the body. what the client has requested - "my head resting on my hubby's shoulder" can't be done. Some sketches, framed up shot and client's feedback here.